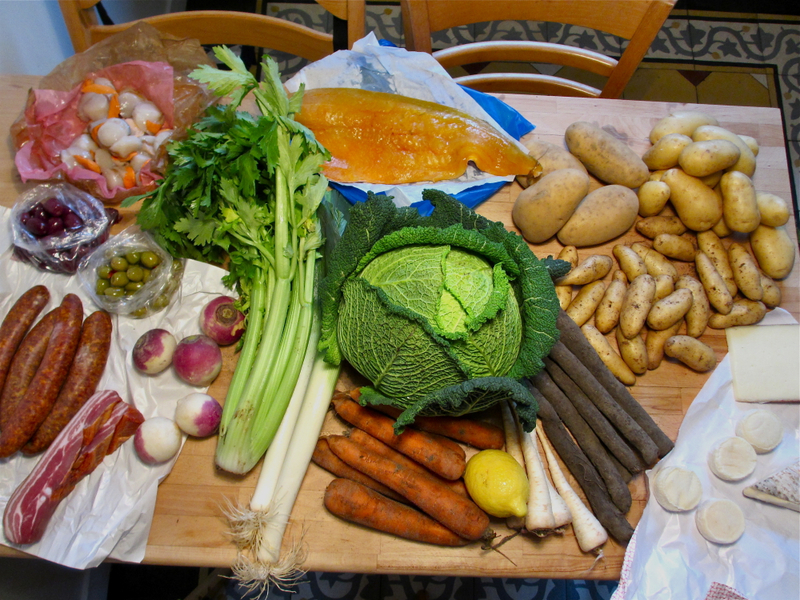 Today, after my visit at the street market not far from home, I couldn’t help unpacking everything I had bought just to admire my great catch. When you look at the picture, you’ll know what my family will eat in the coming days – and let me introduce you to some of the produce and products you see. 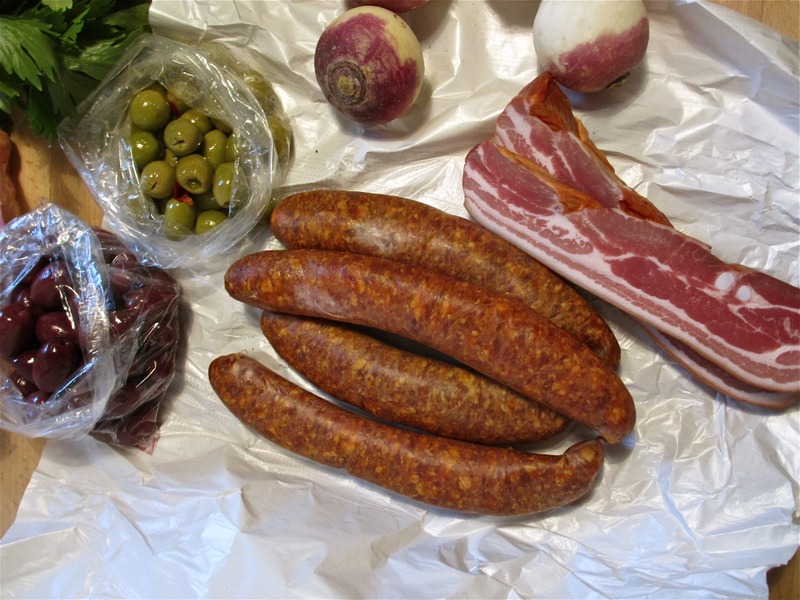 I’m looking forward to heat the four nice and hearty saucisses de Montbéliard (far left), smoked over wood shavings in the French far east close to the German border. Maybe I’ll prepare a potato salad with it, made from that kilogram of famous and noble La Ratte potatoes (the small guys in the potato section), a very firm, nutty variety. Tonight I’ll surprise my loved ones with an interesting dish combining, as the French say, “mèr et terre”. 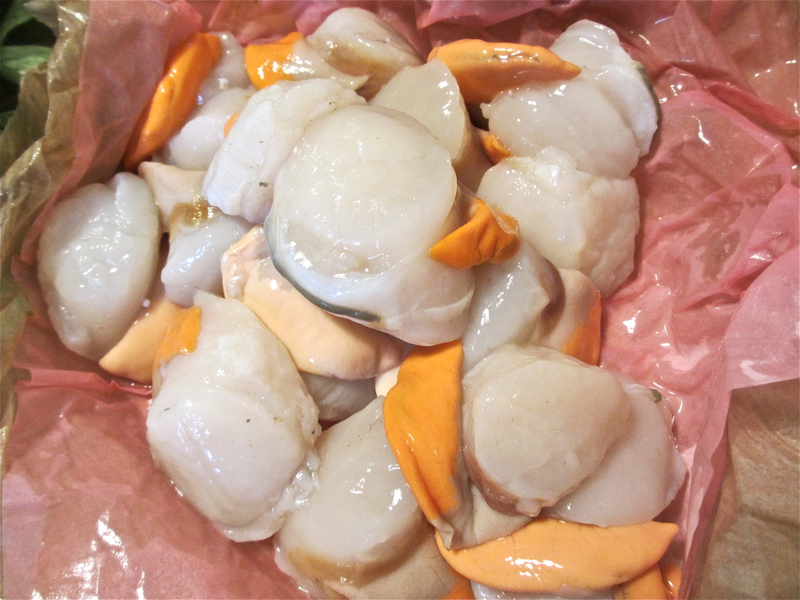 It’ll bring together the Savoy cabbage (center) and the scallops (in the left upper corner), called coquilles Saint-Jacques in French. Lovely name, lovely seafood. I admit, I don’t know yet what I’ll do with all the other catches of the day: the smoked haddock (top), the olives, the celery. Have you noticed the dark skinny sticks next to the cabbage? That’s black salsify, a superb vegetable that most people don’t know at all which is a shame. Equally good are the parsley roots next to it and, hey, combined with the formidable sand carrots and the tiny turnips the four of them could make an excellent, heart-warming winter stew! I’ll just add some butter, chicken stock, an onion maybe, a hand full of raisins and a pear, cut in slices and slightly colored with butter in a pan. Sounds good. But maybe I’ll come up with something completely different. That’s the real joy of cooking. Saucisses de Montbéliard: one of the best things to do with pork. Hi Ullrich…. idea for a good “Potée Franc-Comtoise” with a strong red wine (Côtes du Jura, Corbières, Côtes du Rhone ….. ) . you’re right, as always, when it comes to the wine. I have a Languedoc at hand, a Bergerie de l’Hortus, not a great wine but a pretty decent one. It will do the trick. Unlike you, I’m not such a stable contributor. Your output is remarkable – and I always enjoy at least the constantly great photos. And I do read at least 75 percent of your entries! You teach me lots of things. You didn’t mention the lovely cheeses hiding there in the right bottom corner of the photo! But your market catch looks great. You’re lucky to have the excuse of feeding your family to buy so many tempting ingredients… as a student cooking for 2 people, I have to sadly walk past most of the things at my market as we wouldn’t be able to eat it all quickly enough. But it’s nice to faire du lèche-vitrine, n’est-ce pas? It’s true, the fewer people you are the harder it gets to get properly fed. Still, street markets are a good option for you, too. You just have to think a bit harder. If you buy, say, the huge savoy cabbage I bought on that day, you’ll have to think about it like a chess player looking two or three moves ahead. Like this: The first day, you take some cabbage leaves and turn them into delicious Asian steamed dumplings, using the leaves as the wrappers. The second day you’ll use half of it shredded as a green vegetable side dish. The third day you’re not keen on cabbage again, so you’ll wait until the fourth or the fifth day and use the rest of your cabbage – with lots of other stuff – as an ingredient of a soup or a pot-au-feu. See the idea? You can buy big things, too!